New Delhi : Member of NITI Aayog and also a Noted economist Bibek Debroy on Tuesday slammed the United Nations' new development goals, saying so many goals and targets would drive governments "nuts". "I'm greatly disturbed by what is happening on the SDGs. Eight goals, 21 targets, I can understand. Seventeen goals, 169 targets, one per country almost, you will go nuts! "Imagine the plight of the countries which will now have to collect data for these (SDGs), if at all collecting that data is possible," Debroy said. "In terms of policy, it is always good to be simple, to be focused, to have clear, concise language," he pointed out. World leaders are slated to adopt a set of new development objectives in September, which will replace eight UN Millennium Development Goals (MDGs) due to expire. These include objectives like ending poverty, reducing child mortality and tackling climate change. "I look at some of those proposed goals and I don't understand what they mean. 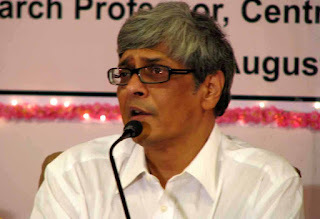 It's as if you are looking for a unified field theory and are trying to solve every problem under the sun," Debroy said.